A diagram of the Terminal 1 replacement plan selected by the airport authority. The San Diego County Regional Airport Authority Board announced Friday that it has chosen a $2.2 billion plan for replacing Terminal 1 that is the quickest, least costly and leaves the most space for future parking. 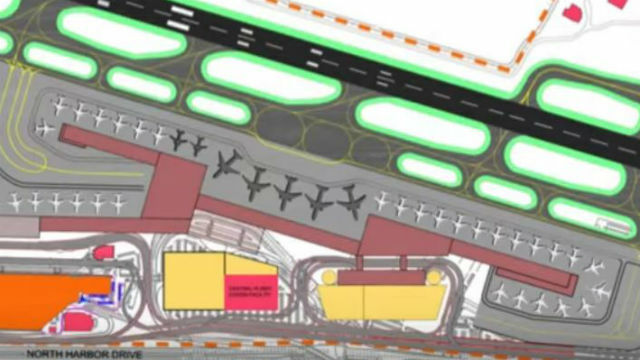 The plan, the fifth option considered by the authority, calls for two long wings of gates at either side of a new international facility with centralized customs processing. The new terminal would replace the easternmost gates of Terminal 2. The plan now heads to environmental review, which is expected to take until the middle of 2017, before construction can start. The work will include a new roadway separate from Harbor Drive to handle airport traffic exclusively, a bridge from the closest trolley station, additional overnight aircraft parking and demolition of both Terminal 1 and the Commuter Terminal. The project will add at least 10 new gates and increase the airport’s capacity to 28 million passengers per year from the current 19 million. The new project follows the Green Build, completed in 2013, which added 10 new gates and additional aircraft parking. A new rental car facility is currently nearing completion on north side of the airport. No tax dollars are involved in the project because San Diego International Airport is funded through its own revenue.